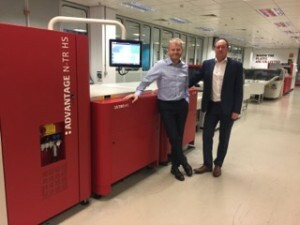 NEWSPRINTERS, a wholly owned subsidiary of News Corp UK and Ireland, and which celebrated its 10th anniversary of newspaper manufacture last autumn, has extended its platemaking and workflow contract with Agfa for another four years to 2022. As a result of the new deal, all 20 processors at the three manufacturing plants, Eurocentral in Scotland, Knowsley on Merseyside and Broxbourne in Hertfordshire, have been replaced with Agfa’s new chem free Attiro clean out units. Six Polaris platesetters have been replaced with new high speed Advantage N TR XXT platesetters delivering up to 370 single plates per hour. In addition, five new fully integrated Nela high speed panoramic plate punch-bending systems have been installed. “We wanted to upgrade the systems to manage the obsolescence of the older Polaris platesetters, provide greater flexibility and reduce operational costs,” says Newsprinters group manufacturing director Steve Whitehead. The six replaced machines are now in the company’s spare parts store and will be used to service the remaining 14 Polaris engines still in operation within the group. “The new Advantages – running at 370 single plates an hour compared to 220 plates previously – give us much greater resilience and flexibility. Additionally, we have installed five new pano benders, three in Broxbourne and two in Knowsley, and we have moved one of the older benders from Knowsley to Eurocentral, improving resilience further in Scotland. The faster systems will enable Newsprinters to meet more demanding editorial requests providing an enhanced and more flexible service to its newspaper customers. Explaining the business partnership with Agfa, Whitehead tells PJ: “We embarked on a much bigger project that we called ‘Beyond 2018’ as this year marks the official end of the 10-year agreement with Agfa. Launched in 2015 we looked to anticipate what the future might look like, taking into account changing demands, advances in technology and of course costs of ownership. “We looked at Kodak, Fujifilm and Agfa and we went through some initial design concepts with the three suppliers, who all offered unique approaches, but there was always an advantage in being the incumbent, given the complexities of upgrading in a busy live environment. “Our whole workflow from London Bridge headquarters to our manufacturing plants has been Agfa since 2007, and so disrupting that environment was always going to be a challenge. Simon Garrod, operations manager at the Broxbourne site, project managed the installation for Newsprinters and adds: “We have had a great deal of experience running projects with Agfa. They are professional, well organised and that gave us that extra confidence too to work with them on a project of this magnitude. We knew the constraints were tight and they met everything we asked of them. The three-plant project started in May last year and was completed ahead of schedule in early October. The entire value Agfa Graphics brought into the deal, including a number of software-related upgrades, helped Newsprinters to reduce its cost of operation – an important consideration when you use around five million plates a year. “The challenge we have going forward is keeping our presses full. We don’t know what our plate needs will be in four years time. However, with more national titles taking advantage of the opportunities we present and with regional portfolios generally requiring a high volume of plates, we are optimistic about the future and Agfa should benefit from a requirement for more plates,” adds Whitehead. 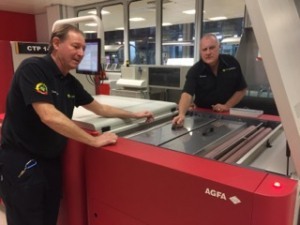 Nick Lazell, Agfa sales manager newspapers, adds: “The installation of the new equipment was a challenging project updating every CTP line in total with 31 individual pieces of equipment over the three printing sites. Anthony Strelitz (Agfa service manager) and the Agfa newspaper service team working in collaboration with the Newsprinters teams delivered the project in a live production environment and ahead of schedule. A separate project has started now where Newsprinters and News UK are working with Agfa to move systems into the Agfa Cloud.